That summer, I opted to spend 10 days hopping around the Greek Islands. My first stop was the photo favorite of Target calendars everywhere, Santorini. Since the island is famous for its strong, traversing donkeys that can carry you up and down a long set of steep stairs to the port, I set out for the steps in order to snap some photos. On my way back up, I ran into some American university students and due to my Virginia hometown, commented on the Virginia Tech (univeesity) t-shirt one was wearing. They explained they were backpacking their way through Europe and then asked me how long I’d been living in the UK. “How did you know?,” I exclaimed. 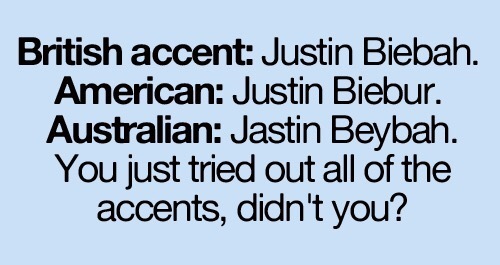 “Your accent is funny,” they answered. It didn’t stop there. Last fall, while chatting in the hallway at work in Italy, with some of our program’s American study abroad students, one student interjected with, “Wait. What country are you actually from?” I looked at them in disbelief. Plus, I thought I’d already told them that I called both coasts of the US home. The student defended her question with, “But you don’t sound right.” Sigh. What does this all mean? In addition to the changes I mentally experienced by moving to different places, the language inadvertently changed me. For years, even before moving abroad, I used a mix of the southern and west coast regional vocabulary. My southeast Virginia upbringing failed to bless me with a southern accent yet, at times, friends reported hearing a twang when I said certain words. Likewise, moving to the Pacific Northwest and then to San Diego brought new slang and a move towards an all-out exclusion of the word, “y’all.” Throw in the stories about my accent above, and well, I think you get the picture. Along with my personality, values, beliefs, and ways of thinking developing and progressing, my actual language and way of speaking morphed into a mutt of accents. My thoughts drifted back to reports of Madonna and Lindsay Lohan adopting temporary British accents and I came across a recent article from Atlas Obscura writer, Dan Nosowitz. He explained, “It is not especially easy to consciously change an accent…But for people who move around, or who spend a significant amount of time talking to people who speak in a different accent or dialect from their own, patterns of speech and pronunciation can prove strangely fluid.” Bingo. That’s what was going on. While living abroad, my community had grown into an amalgamation of people from all over the world with a matching plethora of accents. At the same time, I was still curious as to how this was happening. Jennifer Nycz, phonetics and sociolinguist specialist at Georgetown University, continued in saying, “It’s not always obvious, but we all make these little shifts depending on who we’re talking to, what we’re talking about, the way we feel about what we’re talking about, and any number of other things.” SO, since psychological research indicates that we “tend to like people more when they mirror us in certain ways: posture, facial expression, and accent,” it seems that I could have been subconsciously altering my phonetics, particularly my intonations on certain syllables, in order to fit in better and adapt to life in my new home. I am definitely guilty of having a swarm of British friends in Japan and then making more of them in the UK itself. A few words about the way I seem to speak now. I incorporate a lot more of “keen,” “queue,” and “quite,” words more often employed in British English. When stating thoughts or feelings, I frequently say the primary idea and then the “I think”, “I hope”, or whatever it is. I believe I can attribute this to the structure of the Japanese language and how it translates into English. I have simply brought this same sentence structure back to my native English. There are some words, such as “probability” and “opportunity”, that I now find myself saying with a more pronounced “-ty” sound at the end. Funnily enough, British friends still complain about my nasal American accent while American friends – who haven’t been around me abroad or recently – will comment on my weird accent and slightly British intonations. Years into this messy and ongoing process, I’ve come to see that my language and accent were parts of me – my identity – that I didn’t expect to change but did. And the changes later made me more conscious of the way others and I use language to communicate effectively. It also makes me feel awkward to say Italian words in a normal American accent because I feel as if I’m pronouncing them wrong. Simultaneously, people around me could very much view me as pretentious when doing so. These speaking quirks I’ve inherited and adopted at the very least make for amusing conversation starters and I can sometimes have people guess where I am from.